Do you know that 50 percent of the world’s forests are gone? And if we continue to live like we do, we will only be left with 10 percent. This is happening because we cut down more trees than we plant. Global warming, pollution, natural disasters; all of this is happening because we are using the resources of our planet irresponsibly. If we all make an effort on an individual level, we can make a difference. If you are an environmentally conscious person looking to make a difference you need to make smarter choices, such as opting for renewable energy. With a considerable drop in prices, installing solar panels has become easier than ever. Use a solar efficiency calculator to find the best performing solar panels. Here is another small step that you can take. You can choose green furniture and contribute to reducing the carbon footprint. This may not sound like a big deal, but it is. Trees are the solution to most of the world’s pollution problem, and hence we need to maintain them. The increase in deforestation is happening because we are recklessly cutting down trees for urban development and also our furniture needs. If you want to stop this from happening, make sure that the furniture you are buying is made from sustainable wood. Search for products that are certified by Forest Stewardship Council (FSC) to ensure that the wood is harvested sustainably. Bamboo is the best alternative to the wood with numerous economic and ecological benefits. It is a renewable resource as a bamboo plant needs only 3-5 years to grow as compared to wood that takes longer time considerably. Hence, it is easier to sustain the Bamboo’s production without harming the environment. Moreover, Bamboo can grow easily without any fertilizers or pesticides, which means it is 100 percent organic. Apart from its environmentally friendly nature, Bamboo also has an aesthetic advantage. First and foremost, it is lighter than wood. Other than that, you can find a variety of styles and forms of Bamboo furniture. Its rustic beauty adds a touch of modernism and style to your home. Just like bamboo, Rattan is a great alternative for wood. It is a renewable plant that grows fast in rain forests. It is also durable and flexible like wood. It is already popular for outdoor furniture. However, now it is gaining traction as indoor furniture as well. It can adjust anywhere due to its versatility. It can make a perfect headboard for a bed. If you are someone who is traditional or takes inspiration from mid-century, then rattan is a perfect match for you because of its vintage roots. For your dining area, you can make a perfect statement without overdoing it. It is an ideal balance of structured and comfort. 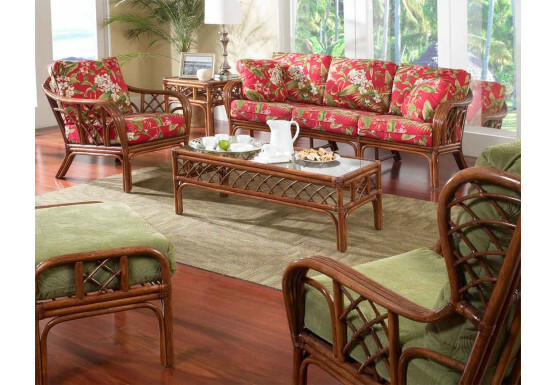 One of the prominent reasons that people opt for rattan furniture is because of its light weight and strength. Also, it is super easy to maintain. All you need is a simple washcloth and a regular dishwashing liquid to wipe it, and you are good. A property of green furniture is that it is easy to recycle or dissemble. Such furniture is usually certified, such as MBDC’s C2C (Cradle 2 Cradle). It is easier to take apart such products, separate them into their constituents and then recycle them in the end. When you select furniture, try to avoid hybrids that are a mixture of materials and hard to separate. Look out for furniture that is made from metal as it is easy to recycle. It is highly likely that furniture made from steel and aluminum is already made from recycled materials. Often plastics can be recycled as well. However, look at the labels before purchasing. The real sustainability comes from quality furniture. It is easier to fall in the trap of low-quality cheap furniture that is shoddily made. It is better to spend a little more on quality furniture than to buy cheap and replace it repeatedly. Hence, the two most important factors while buying green furniture should be great craftsmanship and design. The more you appreciate your furniture, the less likely you are to replace it. Reclaimed wood is another alternative to not waste extra resources. Wood that has already passed the test of endurance by lasting a decade can survive a little longer. Look out for furniture made from Lumber. Lumber is usually used in the construction of factories. Now it is also being reused for furniture. The sources of reclaimed wood include flawed wood, wood saved from rivers or chopped wood that was infested with insects. Your furniture could be toxic as well. Yes, you read that right. When you bring home furniture, it just does not stay there harmless. Like any other thing, it gives out fumes. Furniture that is made from synthetic materials or treated with synthetics gives out gases that can be toxic. Some of the common gases offset by furniture include flame retardants and formaldehyde. Hence, look out for furniture that has been certified by Greengard as it ensures low toxicity. You could also look for furniture that has been treated with natural substances.